Yesterday, several environmental groups from around the region joined together to enter a float in the KW Santa Claus Parade. The Bicycle Forest contributed most of the bikes. Although the forecast was looking grim, the rain held off and it ended up being a pretty good day. Our parade entry was a big hit with the crowds. Check out this video and photos from the day. 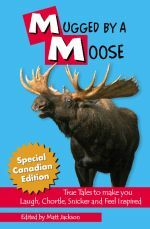 The story of my couchbike adventure has been published in a book called Mugged by a Moose: True Tales to make you Laugh, Chortle, Snicker and Feel Inspired. The book is edited by Matt Jackson. Matt is on a cross Canada tour right now promoting the book. He’ll be at the Burlington Library from 7-9pm on Monday, November 13th for a book reading. I’ll be out as well. Maybe I’ll see some of you there. You are currently browsing the Bicycle Forest Blog weblog archives for November, 2006.